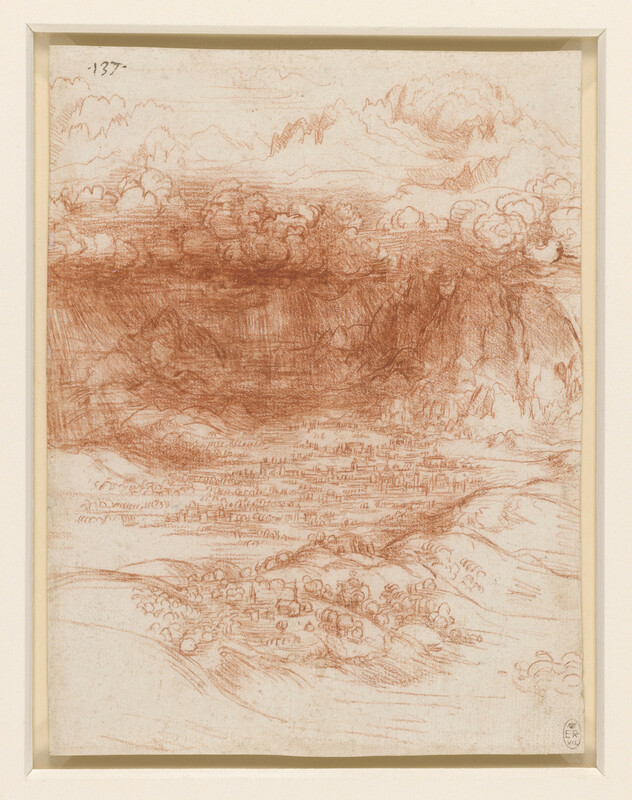 A drawing of a storm breaking over a valley in the foot-hills of the Alps. Above the depicted clouds are high peaks of the Alps in sunlight. A number of landscapes in red chalk by Leonardo can be dated to his second period of residence in Milan, intermittently between 1506 and 1513, in the service of the French occupiers of the city. Some are highly objective, most remarkably a view of the Alps from the roof of Milan Cathedral; some are documentary, such as a distant view of the fires set by Swiss troops outside Milan in mid-December 1511; others are more stylised, of which this is the finest example. But the drawing is not merely, or even primarily, a work of the imagination, and it is abundantly clear from Leonardo's notebooks that he was both familiar with the Alps north of Milan and fascinated by meteorological phenomena. He made detailed descriptions (partly first-hand) and measurements (wholly so) of the valleys; he recorded fossil shells found in the mountains, from which he deduced that the Earth was much older than indicated by the Bible; he described freak clouds and storms; and in a remarkable passage in the Codex Leicester, of about the same date as the present drawing, Leonardo noted how the sky darkened at high altitudes: This may be seen, as I saw it, by going up Monte Rosa, a peak of the Alps which divide France from Italy ... No mountain has its base at so great a height as this, which lifts itself above almost all the clouds; and snow seldom falls there, but only hail in the summer ... and this hail lies unmelted there ... and in the middle of July I found it very considerable. And I saw the sky above me quite dark, and the sun as it fell on the mountain was far brighter than in the plains below. The pursuit of mountaineering began in earnest only in the mid- nineteenth century, and documented earlier ascents of the higher peaks, such as Petrarch's climb of Mont Ventoux, are remarkably rare. But it is plain from this passage that Leonardo, then aged over 50, ascended Monte Rosa to some considerable altitude, perhaps 3,000 metres or more. He presumably made other ascents of the Lombard Alps, and there is no reason why the precipitous view in the drawing, looking down on a localised storm in a valley, should not have been based on experience.